Koh Ta Kiev Bungalows, also known as “Nak’s Shack” is a true home away from home. As soon as you step in the door, Nak and his crew make you feel welcome. Everything about this spacious resort says homey, from the lush vegetable garden to the delicious homemade food and the cozy wooden bungalows with their big open porches. Our favorite thing, though, is the wooden jetty jutting out across the turquoise water, offering perhaps the island’s best sunset views and the perfect spot for stargazing with a late-night cocktail. Just chillin’ on Koh Ta Kiev. Located in the middle of Long Beach, Koh Ta Kiev Bungalows boasts the longest stretch of beach of any of the island’s resorts. Ten bungalows set back from each other and from the ocean offer all guests a level of privacy unrivaled anywhere else on the island. During the day the beach can be hopping, with tour boats pulling up and tourists reveling in the clear turquoise waters and kicking back in hammocks, making the most of their short few hours in paradise. But there’s plenty of beach to go around and you won’t have to go far to find a quiet spot to soak up the island’s tranquil vibe. Once all the tour boats depart for the day, an intoxicating serenity falls over the beach. After a day spent exploring or relaxing on your comfy porch and enjoying island life, tuck into some delicious local food at Nak’s restaurant, enjoy an iced can of beer for just $1, and find the perfect spot for sunset. If the jetty’s taken, there are plenty of deck chairs and tire swings to go around, or you might just decide to sit on the beach and feel the sand between your toes. Offering some of the most reasonably priced meals and drinks on the island, Koh Ta Kiev Bungalows serves food every day from 7:30 a.m. until 9 p.m. The bar stays open a little later for drinks and socializing. If you need to charge your phone or electronics while the power is on during the evening, you can leave them at the bar for safe-keeping. Koh Ta Kiev Bungalows is not always as jumping as other places on the island, which will be a negative for some and a positive for others. But this resort has a simpatico and welcoming family atmosphere, and Nak loves to talk to visitors and share his stories of island life. If you’re hankering for a more party-hardy scene, other bars are just a 10-minute walk away. Koh Ta Kiev Bungalows’ biggest draw are the bungalows. Each one has its own quirks and character, but all ten have huge porches with mattresses and hammocks and they’re perfect for families and couples looking for a place to relax and unwind. Five feature the best en-suites on the island, although admittedly that still isn’t saying much. The other five bungalows have shared bathrooms, and there are also four dorm beds. A few spots for pitching hammocks are available when the resort gets really busy. 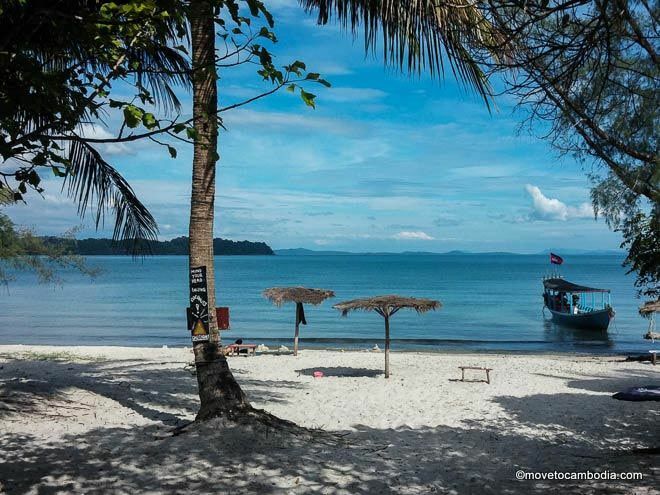 For some, relaxing on the porch and watching people cavort on the beach is a highlight of a day at Koh Ta Kiev Bungalows, but there are also plenty of activities. If you feel like going exploring, a 10-minute walk in either direction will lead you to Crusoe Island or Ten103, and the freshwater pond is less than a five-minute walk away. You can also head out through the jungle to the Chinese Road and investigate the island’s interior, take a trek to the fishing village, or go old-school with a game of beach volleyball. Other options include renting a snorkel and mask and exploring the calm waters off the coast, or grabbing a fishing line and sitting on the jetty, or hopping on a boat for a deep-sea fishing trip. Koh Ta Kiev Bungalows fill up fast, so we highly recommend booking in advance. Although Nak does not currently run his own boat from Otres to Koh Ta Kiev, it’s still easy to get over to Koh Ta Kiev Bungalows. Hop on the Crusoe Island or Ten103 boats, which depart at 11:30 a.m. from Mien Mien and Seagarden respectively, and cost $12-13 return. Nak can also arrange transport from his shop on Ream Beach at $5pp each way. If you want to make the journey more of an adventure in its own right, we advise taking one of the tour boats that leave from Otres every morning. Enjoy a leisurely ride cruising past the beautiful neighboring islands, go snorkeling over picture-perfect reefs, and take a leap off the nearby Elephant Rock before pulling up right outside Koh Ta Kiev Bungalows and enjoying lunch on the beach. Make a booking at Koh Ta Kiev Bungalows now, or look for other accommodation on Koh Ta Kiev.